Can I Smoke if I Have Dental Implants? Dental implants are known for their exceptional stability, comfortable fit, and natural-looking aesthetics. Without the hassle of slippage or messy adhesives associated with traditional dentures and bridges, dental implants are a popular choice for replacing missing teeth. The advanced solution is designed as a durable, long-lasting tooth replacement that becomes a permanent part of your mouth. However, it is important to note that if you smoke, this can have an impact on the longevity your implants. If you are considering this innovate form of tooth replacement and are currently a smoker, you may be disqualified as a candidate for dental implants. 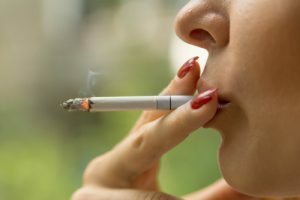 The American Dental Association (ADA) has stated that smoking can increase the likelihood of post-operative dental implant failure. The difference in the success rate between smokers and non-smokers appears to be significant. According to one recent study, non-smokers had a dental implant failure rate of 1.4 percent; conversely, smokers had a failure rate of 15.8 percent. Dr. Robin Rutherford recommends all patients who are considering dental implants to give up smoking at least one month before their procedure—and to stop smoking completely in order to maximize the success and longevity of their results. To learn more about dental implants, or to schedule an appointment with Dr. Rutherford to see if you are a good candidate for the procedure, please contact us today.